What Does Ayakashi Mean in English? 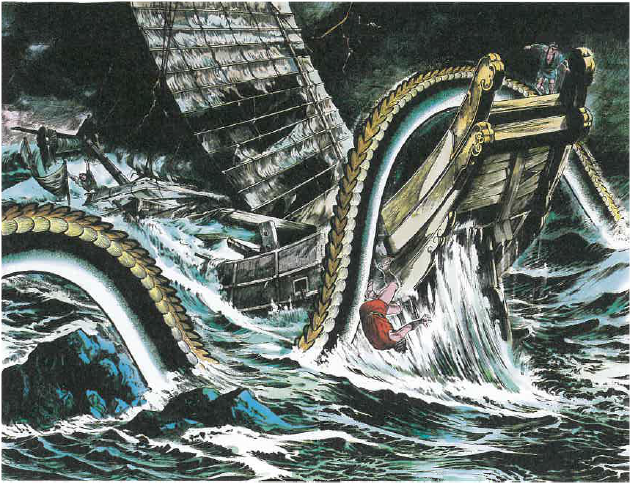 A sea serpent so massive it takes three days to pass by in a boat? Mysterious lights floating by the beach? A generic term for ghost stories? Ayakashi is one of the most complicated and convoluted terms in all of Japanese folklore. There is no easy answer to this simple question. Usually when investigating a yokai I like to start with deciphering the kanji that make up the name. That is your first, best clue as to what the monster or phenomenon is. But ayakashi is written either in hiragana (あやかし) or katakana (アヤカシ), neither of which give any hints as to the meaning. There is an alternate and specific spelling of ayakashi that does use kanji, and we will look into that later. In its most basic usage, ayakashi is a general term for yokai that appear above the surface of the water, and can be translated as “strange phenomenon of the sea.” That fact that this is the surface of the water is important—yokai tend to appear at boundaries, places where one thing becomes another thing. So ayakashi are yokai that haunt the boundary between the ocean and the air, instead of sea monsters swimming in the dark depths. In Nagasaki, the term ayakashi refers to strange lights that dance above the surface of the water, and are found mostly on the beaches in twilight. These lights are different from the typical Japanese kaika (怪火; strange lights), in that the floating fires are said to contain what looks to be small children running around inside of them. This phenomenon is particularly associated with Tsushima city, Nagasaki. Some of these ayakashi no kaika also appear out on the water, where it is said they can suddenly take on the appearance of massive rocks or landmasses that appear out of nowhere. The goal of this transformation is to panic ships, forcing them to change course and run aground or sink. But the irony is, if the brave captain sails right through the mirage, they vanish leaving everyone unharmed. 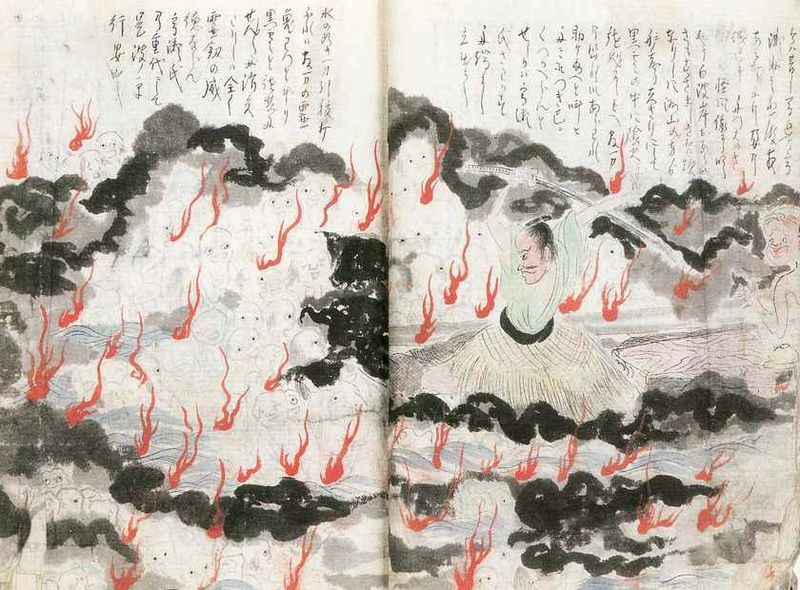 In Yamaguchi and Saga prefectures ayakashi refers to funa yurei, a group of yurei who drowned at sea and now try to sink boats to increase their numbers. Funa yubrei are known to float up to the surface of the water appearing first as kaika, then transforming into figures when they reach the surface. They will demand a hishaku—a bamboo spoon—from any boat they encounter, and if given one they will swiftly fill the boat with water and drag the crew down to the depths. A wise captain always carried a hishaku with holes drilled in it when sailing in funa yurei infested waters. Giving this spoon to the funa yurei means that they cannot sink your boat. 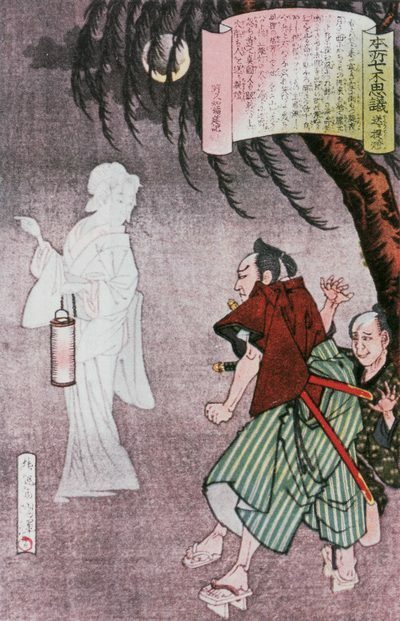 Several other areas in Western Japan use the term ayakashi to describe ghosts of those drowned at sea, who try to sink boats and drown swimmers either for revenge or to swell their ranks. A good example of this is the Shudan Borei. This story of the ayakashi appears only once, in the Edo period Kaidanshu Kaidanro no Sue (怪談老の杖; A Cane for an Old Man of Kaidan). In Taidozaki, in the Chosei district of Chiba prefecture, a group of sailors put to show in order to re-stock their fresh water holds. As they pulled into the beach, a beautiful woman came walking by carrying a large bucket. She said the bucket was filled with fresh water that she had drawn from a nearby well, and that she would be only too happy to share it with the sailors. Hearing this, the Captain said “There’s no well nearby. I’ve heard similar stories of thirsty sailors beguiled by a beautiful woman offering them water, never to be seen again. That woman is an ayakashi!” He ordered the boat swiftly back to the sea. As the men pulled their oars, the woman came running towards the ship in a rage, and leapt into the ocean biting the hull of the ship and holding on tight. The quick-thinking Captain beat her off with one of the oars, and the ship sailed away unharmed. A real-life animal associated with the term ayakashi are remoras, the leach-like fish with sucker bellies that fasten themselves onto sharks and other ocean-going objects in order to get a free ride and some free food. According to folk belief, if remoras fasten themselves to the underside of your boat, you will become stuck in the water and unable to move. In this case, remoras are called ayakashi. 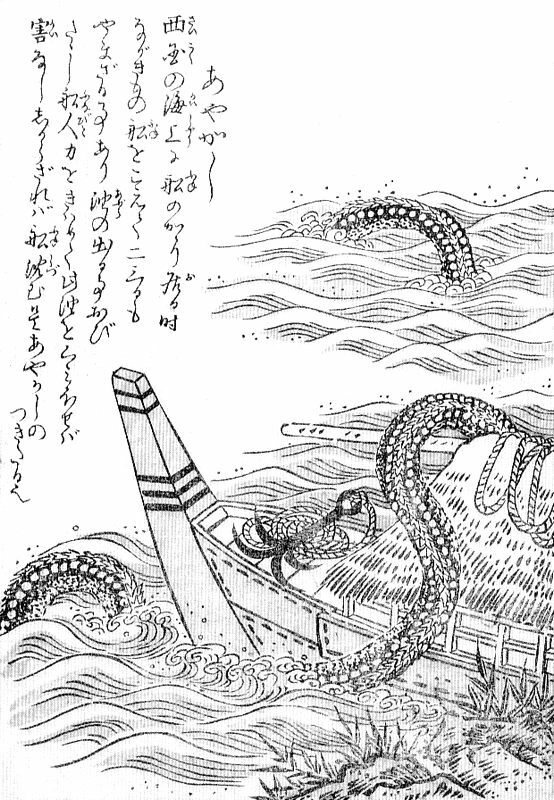 The Ikuchi is a legendary monster from Ibaraki prefecture, that was written about in Edo period Kaidanshu like Tsumura Soan (津村正恭)’s Tankai (譚海; Sea Ballads) and Negishi Shizumori (根岸 鎮衛)’s Mimibukuro (耳袋; Ear Bag). The Ikuchi is described as eel-like and massively long, several kilometers at least. It was not inherently dangerous, but would become tangled up with ships accidently. Crews had to work often for days to get their ship free of the Ikuchi. The most dangerous part was the oil that seeped from the monster’s body. The crew had to diligently clean up all the oil, or the ship would sink. Why Toriyama called his depiction of the Ikuchi “ayakashi” isn’t known. Perhaps he didn’t know the monster’s true name, or perhaps he was using the general term for sea monsters instead of the specific name of Ikuchi. But for whatever reason, such is Toriyama’s influence that Ayakashi has come to describe the Ikuchi in most modern depictions. While no one agrees on exactly what kind of ocean phenomenon ayakashi is, they are all at least agreed that it is SOME kind of ocean phenomenon. Except for Noh theater. Many of Japan’s arts have a specialized vocabulary that is used nowhere else (try going to a sushi restaurant in Japan and asking for some “purple” and you will see what I mean.) As you know (ha ha!) Noh theater uses masks. All of the masks have names, and the name for a male mask of a ghost or violent god is called ayakashi. Noh uses a specialized kanji, 怪士 meaning strange (怪; ayaka – ) + warrior (士; shi). These masks come in variation, like the chigusa ayakashi which is fleshy and more human-like, or the shin no ayakashi with protruding eyes and bulging blood vessels. The most terrifying is the rei no ayakashi, a skeletonesque face with a white pallor and sunken eyes. 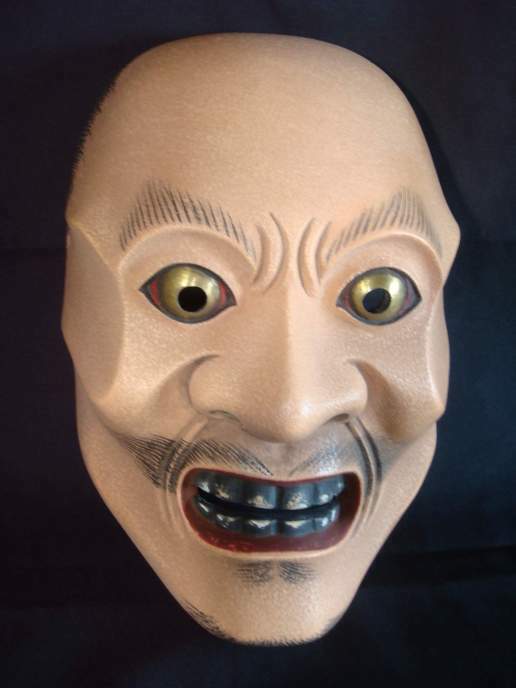 The ayakashi masks were designed around the Muromachi period and where used interchangeably for many ghostly roles, but by the Edo period each mask had been assigned a specific role. Because of the masks of Noh, and Ayakashi no Mono (怪士のもの) can refer to a ghost story of Noh, where one of the ayakashi masks are used. 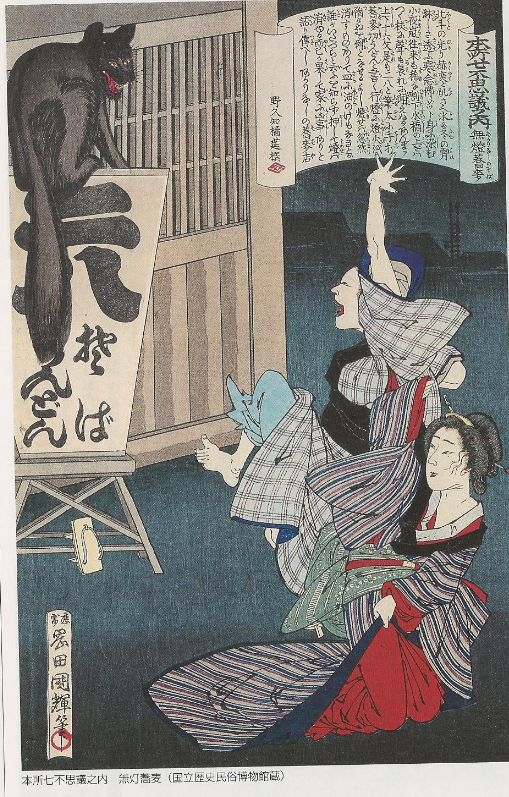 And that is where the confusion comes in, from using the term “ayakashi” as a general word for yokai or “ghost story.” It is … but ONLY in Noh theater. 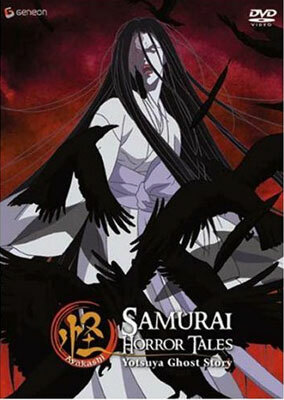 And that brings us to where most Westerners have heard the term ayakashi, in the anime Ayakashi: Samurai Horror Tales. While this is a brilliant series, you will notice that nowhere is there a sea creature of any kind, neither monster nor boat full of lantern-bearing yurei. This started out with me answering a reader’s question on the difference between yokai, ayakashi, and mononoke. It soon became apparent that there was far too much information for a simple answer, and blossomed into this article. And I still didn’t answer the question! Sorry! But at least you will have a better understanding of what ayakashi means! Long ago in a village in Banshu (Modern day Hyogo Prefecture), there was a man named Yube. So stricken with dire poverty was Yube that he had nothing to eat and nowhere to live. In desperation, Yube went to the home of a wealthy dealer in oil and bowed his head on the floor and begged to borrow some money. The Oil Seller loaned Yube the money, and set the conditions for repayment. But when the promised day to repay the loan came, Yube’s circumstances had not improved and he had not the ability to return the money. After listening to Yube beg and plead and beg some more, the Oil Seller finally relented and gave Yube six more months. But he enforced a harsh term for the additional time. Yube was shocked at the demand. But as he lacked the money to repay the loan, there was nothing he could do but set down to drink the oil. The Oil Seller made sure the cups were filled full to the brim, and watched as Yube sucked down every last drop of the thick oil. First one, then two, until finally all five cups were drained. Just as Yube finished the last of the oil, he doubled over with in excruciating pain. First his stomach ached, and then his chest tightened terribly. Yube began to sway back and forth, howling in agony, before he dropped to the floor dead. The news of the Oil Seller’s deed spread quickly through the town, and it wasn’t long before it was overheard by the local magistrate. The magistrate hurried at once to the Oil Seller’s home, and began a thorough investigation into the matter. When he learned enough to know that the rumors were true, he fixed a stern eye on the Oil Seller. The magistrate said this with such conviction in his voice that the Oil Seller trembled in fear. The Oil Seller quickly agreed to the terms, and wasted no time in making the arrangements to give Yube a fine funeral. When the day came, the Oil Seller laid flowers on Yube’s freshly-cut headstone and then bent down to light the lanterns next to the grave while the people of the village silent watched and prayed. When the match was touched to the lanterns, something shocking happened. The five cups of oil that Yube had drunk had seeped from his body into the surrounding soil, and the grave burst into flames, rising up into a fireball. The villagers shouted in surprise. Everyone fled from the grave running as if their lives depended on it. As for the Oil Seller, he would never live another comfortable day in his life; he flesh grew pale and his entire body was overcome with shaking. He ran faster than anyone. Just as everyone fled the grave, another mysterious thing happened. The hi no tama blinked out as quickly as it had appeared; Yube’s oily body was burned up. That is to say, all of the oil in Yube’s body had burned up. Yube himself was left clean and pure again. When the last of the fires disappeared, Yube’s body down in the grave let out a huge gasp as air rushed back into his lungs. With the oil purged from his body, Yube had come back to life and began to dig himself out of his own grave. Pulling himself clear, he began to walk through town, heading back to his house. When Yube came walking through town he came on a huge, noisy bunch of men were gathered in the street. They were making a tremendous ruckus, some shouting with joy and some with anger. as he was still dressed in his white burial kimono that he had been wearing at his funeral. At the site of Yube in his white kimono, the courage of the men fled from them, and soon all the men were fleeing along with it. Yube looked at the ground where the men had been gathered, and was surprised to see that the streets were littered with money. For sure this wild crowd had gathered for illegal gambling, and they had all left their cash behind when they went running from Yube. Yube gathered all the stray money from the streets, and carried it off to his house. But if he expected a welcome home greeting, he was sorely disappointed. To see their dead relative, whose funeral they had been to today, suddenly show up at their doorstep was too much of a shock for Yube’s family. With that they slammed the door shut and held it tight. No matter how many times Yube knocked and pleaded to be let in, they wouldn’t listen and just yelled at him to go away. There was nothing for Yube to do, so sadly he left his house and wandered to a near-by temple. There, he poured out his story to a sympathetic monk who listened patiently. The monk then returned with Yube to his house, and explained Yube’s return to life to the family, who finally let Yube come inside. They called down everyone in the house to hear Yube’s tale, and after that went out into the streets of the village where everyone celebrated Yube’s return. With all the money Yube collected from the gambling den, he was now the richest man in the village. He paid off his dept to the terrified Oil Seller, and proceeded to live happily ever after. This is a very unusual yurei story. Not only does the dead man return to life, but he also becomes rich and lives a happy life. This kind of story is mainly told in the Kansai area of Japan. It is said that there are no monsters or bakemono from Hakone town, but even here one can feel the mysterious touch of the yurei. One night, Bando Hikosaburo was walking home, a kyogen play he had heard over the summer running around in his head, when he saw something frightening. Holding a lantern casting a dim illumination on the scene that was neither dark nor light, a pale blue figure stood before him like some vision. “I am the yurei of Kobata Heiji. Those who look upon me and hear my story will endure neither fear, nor my wrath, nor any disturbing thoughts. With that said, the Yurei suddenly vanished. This took place in the 13th year of Bunmei (1830) at the closing of summer. Even though it is called spring, the weather is bitter cold and the rain is falling. The coming and going traffic dies down in the face of a wind that pierces the body, and the bell of the temple of Houan-ji can only be distantly heard. Looking ahead of them, they saw the light of a lit lantern which they attempted to follow. However, when they got closer to the light, it suddenly blinked out leaving them in pitch blackness. This was the Sending-off Lantern. This print, by Utagawa Kuniteru, is called Okuri Chochin (送り提灯), and depicts one of the Honjo Nana Fushigi (本所七不思議) meaning one of the Seven Wonders of Honjo. Above the bridge that spanned the flowing canal, a soba shop stood whose paper lantern had the words “28” written on it in thick, bold characters. Even when all the fires were put out, and the street was in darkness, this lantern would continue to shine, without candle or oil. Those who tried in vain to douse the lantern would meet with no success, and misfortune would fall upon their household. This print, by Utagawa Kuniteru, is called Akarinashi Soba (燈無蕎麦), and depicts one of the Honjo Nana Fushigi (本所七不思議) meaning one of the Seven Wonders of Honjo.